The Activity Book contains various activities that students can carry out to master core math concepts normally taught in the early elementary years. It contains easy to follow, fun and engaging hands-on activities. The "cut-out" section includes paper manipulatives with instructions that can be cut-out to complete many activities listed in the book. Activities in the book help student relate math concepts to real life situations and truly understand importance of math. 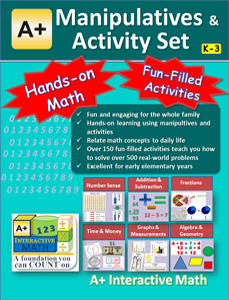 This activity book and math manipulatives kit can be used to supplement any math curriculum.